Happy Friday folks! After today, I will have survived my first week of work at my new job. I've been a zombie all week, but I'm starting to feel like a normal person again today. Hopefully it's a permanent thing and the weekend won't throw me off. The folks over at Weforia (here) are extending their giveaway promotion that I has been going on for the last 10 days. They're going for another five days. Which means, more free stuff for us. If you haven't signed up yet. Now would be the time. Click (here) to visit Weforia. 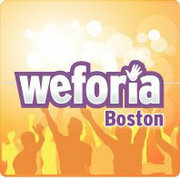 0 Response to "Weforia Extends Giveaway 5 More Days"
Free Domino’s Pizza at South Station - Friday! Free: Dance Into Spring - Starts Today!